Do you like dates? Coconut? Chocolate? If you answer yes, then you would love these delicious balls. They are quick to make and perfect as a snack or dessert to go with your cup of tea or coffee. 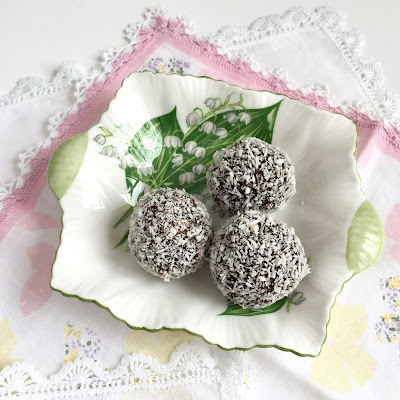 What I like the most about these balls is that there is no added sugar, just the natural sweetness of the dates. My favourite dates are Medjool dates. They are large and soft and perfect to eat at room temperature or cold from the fridge. My boys do not eat dates. Never. Well, until I have made these balls. Now this is one of the favourite treats and I cannot be more happy because of all the goodness packed in them. As I said, they are very easy and quick to make. They can be made in advance and kept in the fridge for some time. So let's begin. 1. Remove pits from the dates and place them in a medium bowl. Cover with boiling water and let it stand for 10-20 minutes. Drain. 2. Process dates, almond meal, desiccated coconut, walnut oil, cacao powder and chia seeds until the mixture comes together and all ingredients are mixed well. 3. Place remaining coconut in a small bowl. 4. Take one teaspoon of mixture, roll it into a ball. Place it in the bowl with the coconut and gently shake/roll it until the ball is covered with coconut. Put it on a plate so the balls won't touch each other. 5. Once all done, put the plate in the fridge for an hour so the balls become firm, then transfer the balls into a box/container with a lid and store it in the fridge. Welcome to my little big world of handmade creations where I keep track of things I make with fabric and embroidery threads. I am glad you are here. Thank you for taking time to stop by. Copyright © 2013-2018 StitchingNotes.com. All rights reserved. Simple theme. Theme images by Ollustrator. Powered by Blogger.